SecuraTrac®, a leading provider of mobile health and safety solutions focused on senior safety, employee well-being and the healthcare industry, announces a new enterprise integration with Micro Key Solutions, a Central Station monitoring platform, and unveils a mobile personal emergency response (mPERS) device for the Verizon cellular network. SecuraTrac is now compatible with seven major alarm and central station monitoring platforms, the most of any mPERS hardware device supplier. In addition, SecuraTrac recently launched its Verizon device with Fall Advisory Services to go along with a product family that works with AT&T and T-Mobile in addition to other carriers in North and South America, Europe, Asia, Africa and Australia. As a result of these 2 strategies, SecuraTrac is able to offer partners maximum flexibility, service coverage and options as a result of its multi-carrier compatibility. The latest integration with Verizon, in addition to service packages already available through AT&T and T-Mobile and many other carriers outside of the United States maximizes the end-user customer experience. 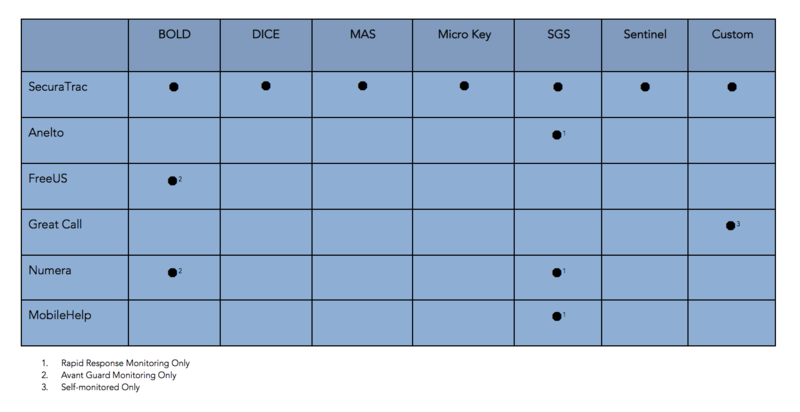 The latest integration with Micro Key Systems represents one instance of a larger strategy. SecuraTrac integrates with MAS® (MASterMind from UTC), Bold Technologies, Secure Global Solutions, DICE®, Sentinel, and has completed a number of custom software integrations to enable quick and seamless new product introductions for all SecuraTrac mPERS solutions. As a result, SecuraTrac products can be monitored by hundreds of central monitoring stations including leaders in their industries: Rapid Response Monitoring, AvantGuard, National Monitoring Center, Statewide Monitoring, Alarm Central, First Alarm, Wright-Hennepin, Life Safety Monitoring and hundreds of others. In contrast other mPERS hardware providers limit the monitoring software and central station options for their customers. This reduces the geographical coverage, may cause disruption and eliminates the flexibility alarm dealers have with their businesses as the table illustrates. For more information SecuraTrac mPERS solutions, visit: http://www.securatrac.com. SecuraTrac® develops, markets, and sells a suite of mobile safety solutions focused on improving senior and employee health and safety through mobile, location-based technology and state-of-the-art, cloud-based platforms. SecuraTrac’s solutions for seniors and employees have won numerous awards for excellence and innovation including The National Parenting Center Seal of Approval, Caregiver Friendly Award, CES Last Gadget Standing and CES Mobile Apps Showdown among others. The company is headquartered in Hermosa Beach, CA. For more information, please visit http://www.securatrac.com.